This is not as my thesis abstract. Just as introduction. The theme of thesis is why Yokosuka-city and Nakano-city were introduce smartphone location based game app "Ingress", and what make difference between two cities for addressing promotion actively. 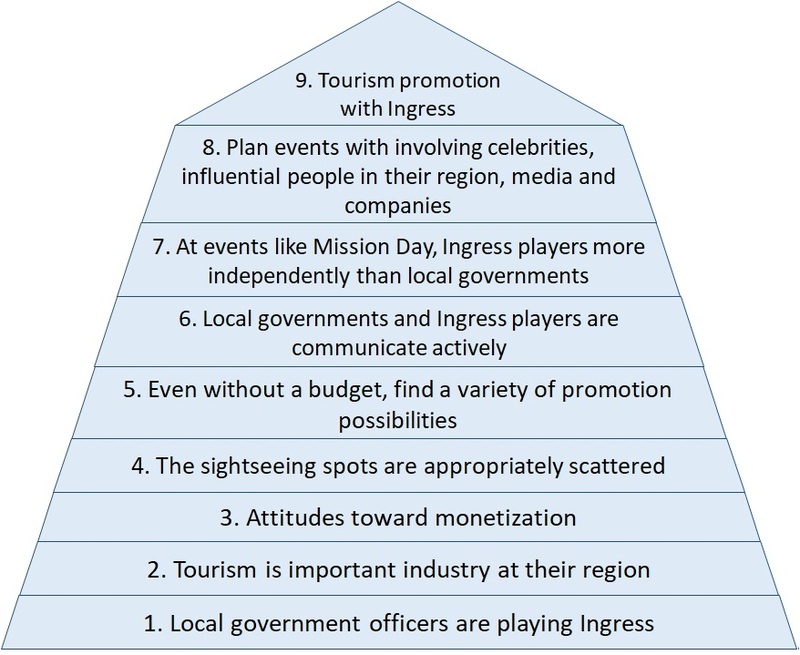 I made conclusion about what elements will be wanted for tourism promotion with Ingress through interviewed both cities on November 2017. Local government officers are playing Ingress. Tourism is important industry at their region : If you don't have to attract tourist or city features as residensial area and commercial area are nearby doesn't have to do tourism promotion with Ingress. Attitudes toward monetization : From December 2015, Ingress has official event paid tickets, in-app billing store and establish advertisement monetizing with partership portals. Yokosuka-city started with Ingress was completely free and now Ingress has monetizing but it's satisfy individual's desire of collecting, not as level up with payments, they doesn't change their mind. On the other hand, Nakano-city stopped promoting as a cause of moneytizing. The sightseeing spots are appropriately scattered : Tourism, it needs go around vast and various areas. Even without a budget, find a variety of promotion possibilities. Local governments and Ingress players are communicate actively. At events like Mission Day, Ingress players more independently than local governments : Ingress players are necessary as perticipants of Ingress real events and promotion events in Japan. Plan events with involving celebrities, influential people in their region, media, companies : Not ask and request but involve.